Poke-Power: Form Change. 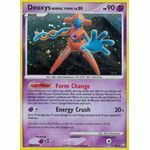 Once during your turn (before your attack), your may search your deck for any Deoxys and switch it with Deoxys Normal Forme. (Any cards attached to Deoxys Normal Forme, damage counters, Special Conditions, and effects on it are now on the new Pokemon.) If you do, put Deoxys Normal Forme on top of your deck. Shuffle your deck afterward. You can't use more than 1 Form Change Poke-Power each turn. [P][C] Energy Crush: 20+ damage. 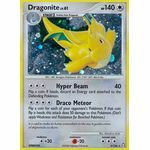 Does 20 damage plus 10 more damage for each Energy attached to all of your opponent's Pokemon. [C][C][C] Hyper Beam: 40 damage. Flip a coin. If heads, discard an Energy card attached to the Defending Pokemon. [P] Destiny Bond. 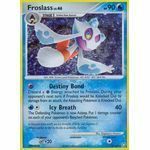 Discard a [P] Energy attached to Froslass. During your opponent's next turn, if Froslass would be Knocked Out by damage from an attack, the Attacking Pokemon is Knocked Out. [W][C] Icy Breath: 40 damage. The Defending Pokemon is now Asleep. Put 1 damage counter on each of your opponent's Benched Pokemon. [P][C] Shadow Force. Choose 1 of your opponent's Benched Pokemon. This attack does 20 damage to that Pokemon. (Don't apply Weakness and Resistance for Benched Pokemon.) Flip a coin. 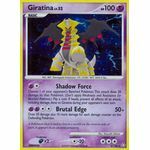 If heads, prevent all effects of an attack, including damage, done to Giratina during your opponent's next turn. [P][P][C][C] Brutal Edge: 50+ damage. Does 50 damage plus 10 more damage for each damage counter on the Defending Pokemon. Burning Poison. Choose either Burned or Poisoned. The Defending Pokemon is now affected by that Special Condition. 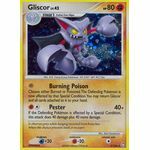 You may return Gliscor and all cards attached to it to your hand. [F][C] Pester: 40+ damage. If the Defending Pokemon is affected by a Special Condition, this attack does 40 damage plus 40 more damage. Poke-Power: Flash Fire. Once during your turn (before your attack), you may move a [R] Energy attached to 1 of your Pokemon to Heatran. 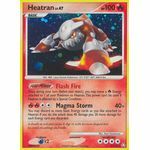 This power can't be used if Heatran is affected by a Special Condition. [R][R][C][C] Magma Storm: 40+ damage. You may discard as many basic Energy cards as you like attached to Heatran. If you do, this attack does 40 damage plus 20 more damage for each Energy card you discarded.